Is there already a thread for random screenshots and general thoughts that don't really count as stories/legacies? If so then I apologise for starting a new one. They can always be merged if someone points me in the right direction. 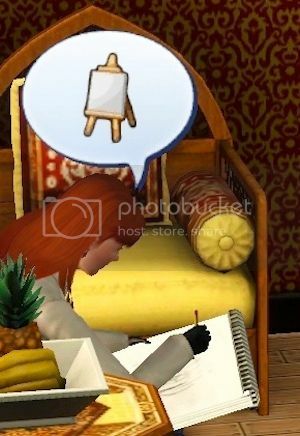 At the moment I'm playing in Aurora Skies and putting a sim through a Fine Arts degree (but very slowly because she's too poor to stay for more than a week at a time and I accidentally deleted the mascot's basket so she couldn't take the test to get a scholarship!). Today it was the full moon - the game went crazy and turned a huge proportion of the students into zombies! They were freaking everywhere, groaning and flopping their heads about. What a crazy campus. I locked my active sim in her room so she wouldn't get her brains chewed up. If this continues I might turn the full moon off because it's too tiresome to have this many zombies all over the place. 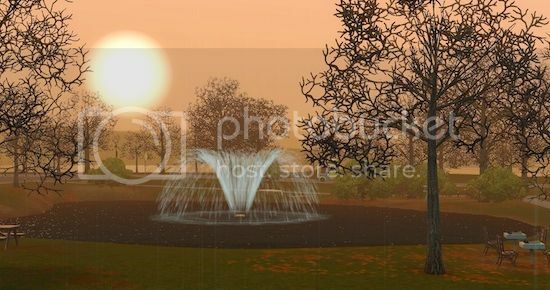 In other news, I downloaded Midnight Hollow and had a very quick look around. I like the look of the houses and the general eeriness of the town (the graveyard looks amazing). Some people seemed to be saying that it was too dark in their games but mine looked OK. Maybe it was just the contrast if they'd recently been playing a sunny world, or perhaps it has a lot to do with your monitor. 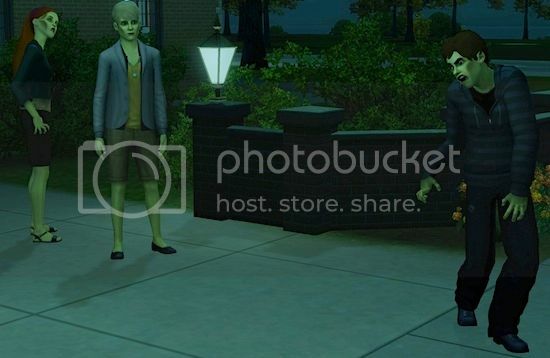 It seems to me that Midnight Hollow is effectively a TS3 version of the set of any Tim Burton film I've ever seen. 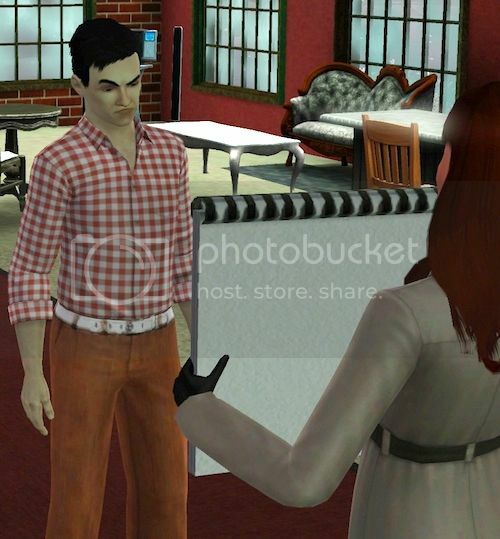 A Johnny Depp sim is clearly needed here. Another full moon happened in my game today, this time while in Aurora Skies. 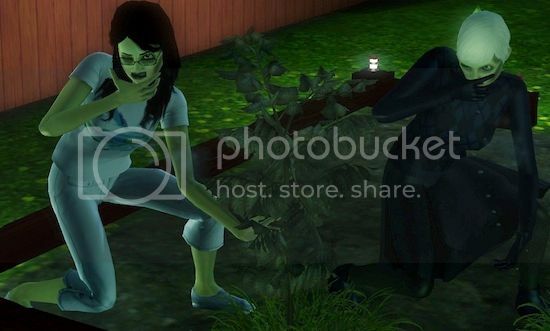 I was surprised to see Somayea turn up in my allotment with her zombie friend! Thanks for chewing up all my plants. Oh well! I've built a proper fence round the veggie patch now, with a locked gate, so that should put an end to zombies munching on my food supplies. I checked out the Skylight dance studio. 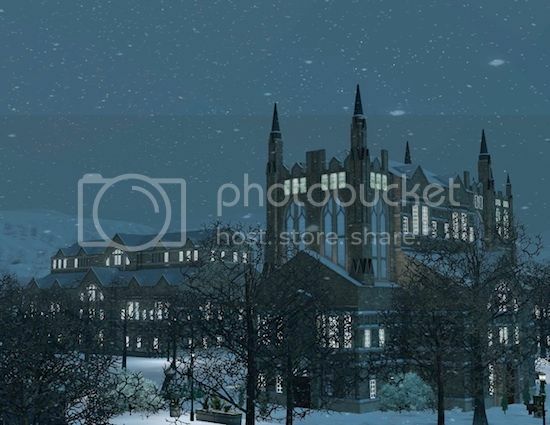 This is the sim I'm playing at the moment. Her name is Sugar (if anyone's read 'The Crimson Petal and the White', this is Sugar from that book - originally I made her for the specialist career that comes with Twallan's Woohooer mod, but since I don't normally play with that mod, she is now living a somewhat more respectable life ). I did ballet when I was younger, so I can say with some certainty that she needs way more practise! Not very graceful. But it'll keep her limber. She went back to uni for another term and got to experience Autumn while she was there. It looked really lovely. 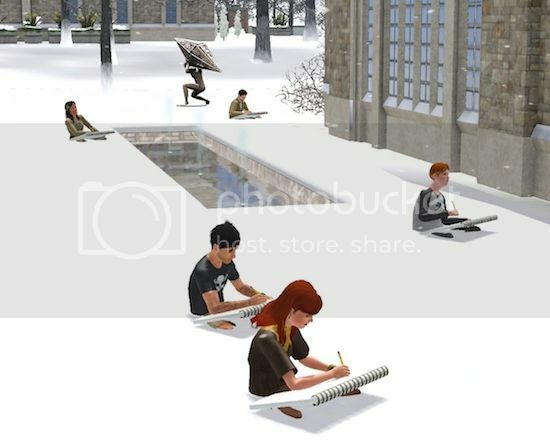 Only trouble is that the Fine Arts degree students are required to sketch outdoors for one of their classes. This has to be a highly unpleasant way to spend two hours in the snow! The guy sitting behind Sugar turned up in short, so his balls probably froze. Poor lad. Despite their sure and certain frostbitten bits, they all stayed around afterwards to make an igloo. 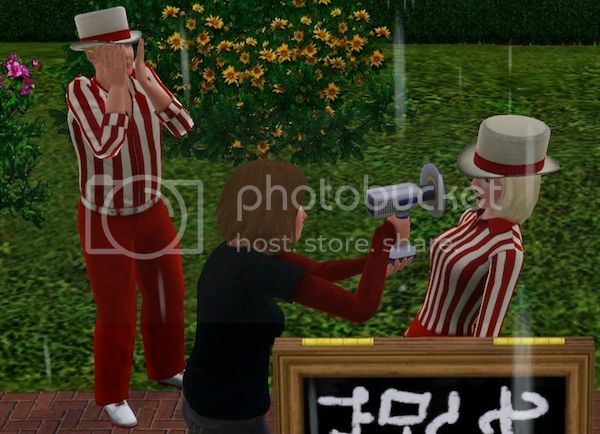 Crazy sims. My current game is truly obsessed with zombies. Today I was rather surprised to see Ollie appear in the garden, looking a bit off-colour and seemingly very worried about the rain. I was happy with the new fence around the vegetables, though. Worked a treat - no zombies munching on my plants! I also noticed that the postlady wears very long black gloves. It seems kind of sinister. 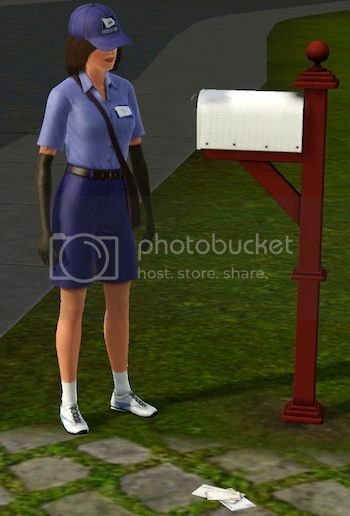 She also fails at putting the letters inside the postbox, but maybe her weird gloves hinder her from opening the box. Sugar finished her Fine Arts degree today (yay!) and I was glad as I was growing slightly weary of sending her to university. For her final term I wanted her to focus on her studies so moved her to a little house. Too many distractions in the Halls. Sadly her new house was burgled on the first night and the police failed to catch the crook. 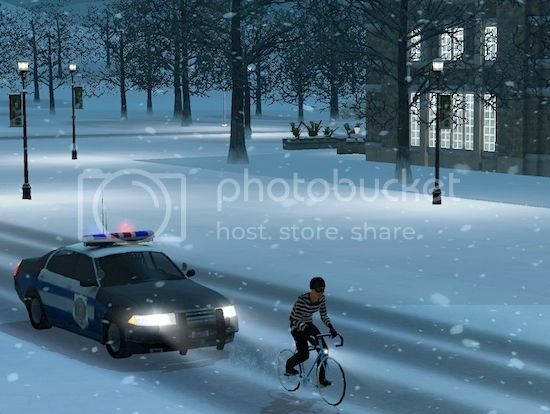 Quite how they failed to catch him I really do not know - he's escaping by bicycle FFS! 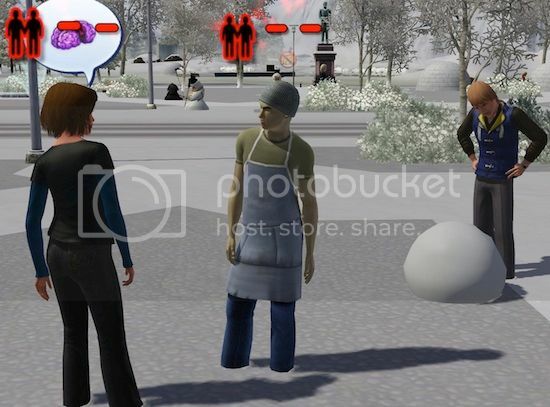 Urgh, stupid sim-police. He made off with a kitchen counter and the toilet, but since other counters were available and Sugar has a steel bladder, I didn't bother replacing them. Money's tight as a student - can't go around buying new appliances! A little like me, Sugar felt ill today. Also a little like me, she fancied spicy food to soothe her sore throat. 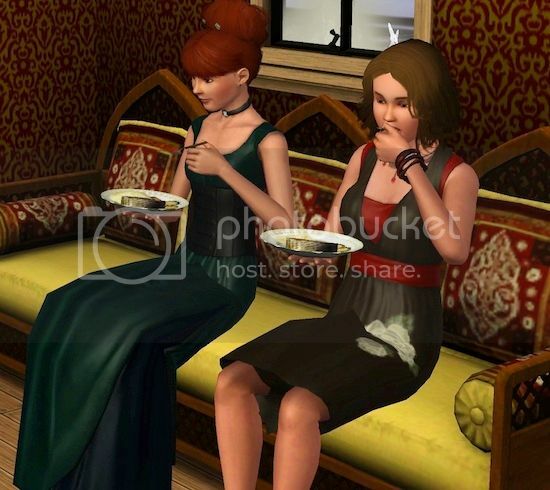 I, however, did not need to blow off steam quite as literally as a sim after the meal, and I certainly did not lodge myself in the kitchen sink. 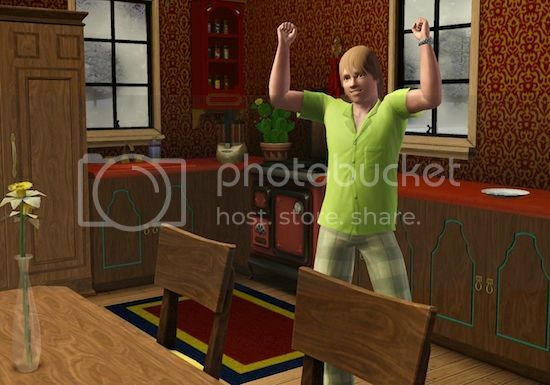 I've seen sims get stuck in furniture before, but never at quite this angle. Spooky Day came around so some pumpkins were carved and an invitation was received to attend a fancy dress party. 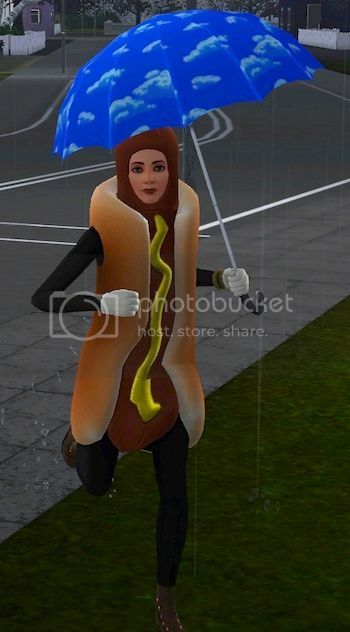 A spot of running through the rain while wearing a hotdog is the most fun you can have in Aurora Skies in Autumn. And who do I find at the party? Yes, Ollie again! But this time not zombified. 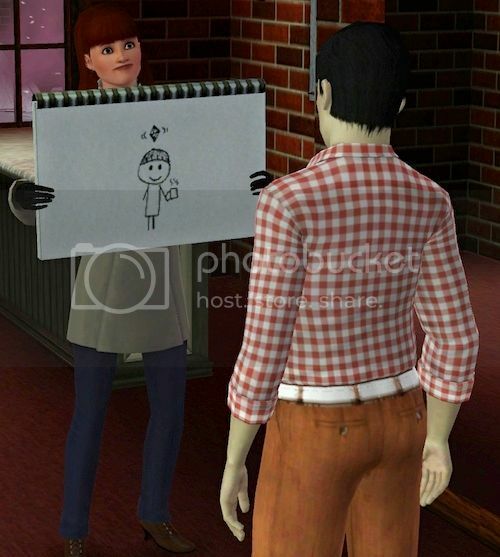 I have not been keeping an eye on our SF sims in this game, but Ollie seems to have become a celebrity. He fancied Sugar quite a lot and I thought there might be a bit of romance to follow, but Mr Celebrity Ollie would not talk to Sugar despite her using all her charms (and she has a few). What's putting you off, Celeb-Ollie? Be honest. 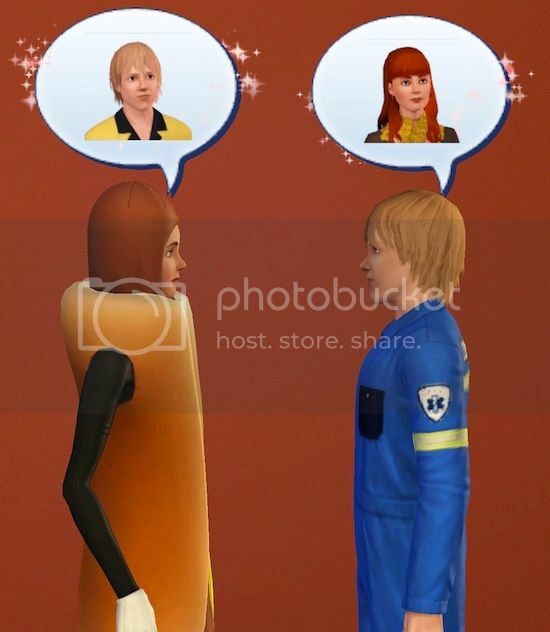 Is it the hotdog dress? Hmmmm. Well. What a lot of weirdness I encountered today. First up, a quiz! What are these pumpkins meant to be? The first one is obviously a classic pumpkin-y face. It turned out just fine. The second and third ones , though, I think were meant to be 'silly' and 'cat' or something of that sort. They just look like some total maniac went nuts with a chainsaw. I hope I will do better with my IRL pumpkin later this month. 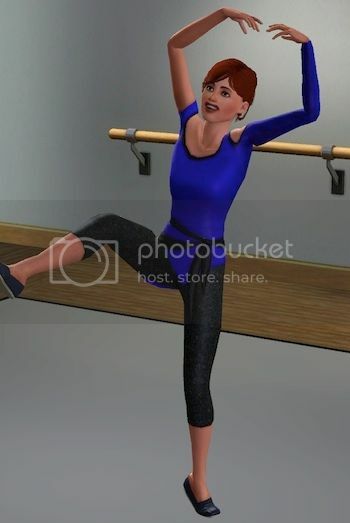 So nice that there are now leotards in TS3. Daft word, daft garment. Never mind. Sugar was a bit mad today, running around collecting butterflies while it was snowing and while wearing her leotard. It is not suitable snow-gear, dear. "FAME!" Sorry, no celebrities allowed. "FAME!!" No, stop it now. "FAME! I'm gonna live forever!" No. Just no. Same old full moon, same old SF zombies. 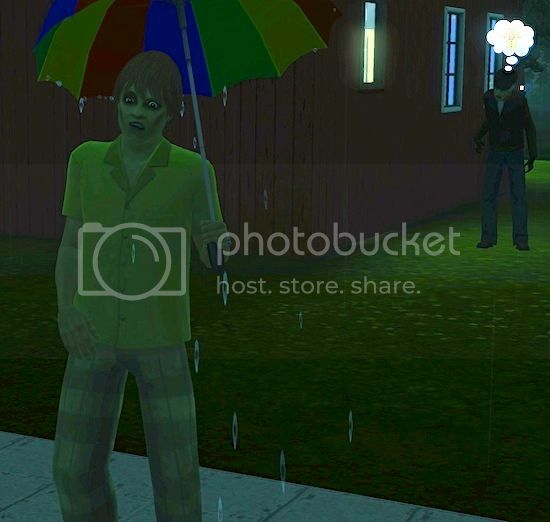 Somayea was quite handy in zombie form, however, as she enjoyed attacking the paparazzi around town. Go on, Somayea, eat their brains! Ollie also became a zombie again. I've told you once already, Oliver - get off my lawn! Actually this was the beginning a mystery, with multiple Ollie zombies turning up all over town. Totally overrun with zombified Ollies. Can you imagine?! Slightly underdressed, there, given that it's now winter. Being underdressed was another theme of the day, actually! The full moon passed and I still kept seeing Ollie EVERYWHERE. I thought I was losing my mind. So Sugar started chatting with these many Ollies and discovered that they were all doppelgangers. Some of the Ollies were friendlier than others. 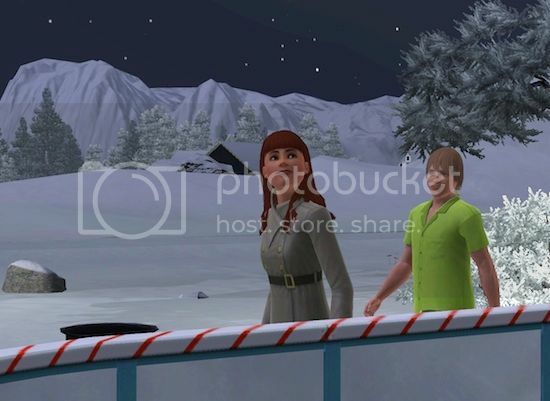 Anyway, it seems that the game kept importing new Ollies to work at the festival lot, then the Ollies would incorporate themselves into the Aurora Skies population. 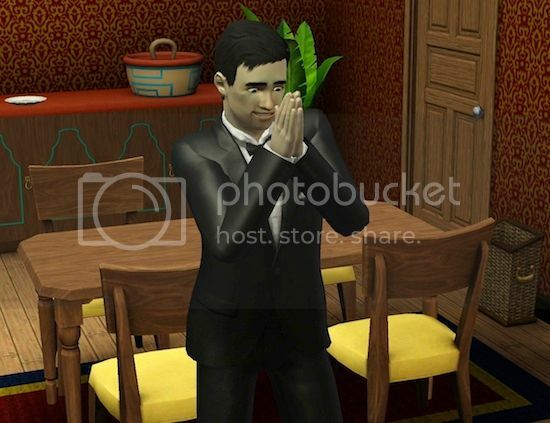 I deleted some of them, leaving the original Ollie (but he is now too much of a celebrity to talk to any other sims in town!) and this one, who was the nicest. I guess they'll just keep spawning unless I figure out how to stop them. It's madness I tell you. Sugar came across the SF sims in the park while she was out jogging. At first I thought they were having a nice day out playing in the snow, but then I realised that things were quite amiss, as Celebrity Ollie was so aloof that he'd become lonely and was building himself a snow-friend, while Minty and Caspin were having some blazing row. For the record, I do not like being yelled at, so please lower your voice Mr Green! I decided that Sugar should befriend them all as best she could and see if more harmonious simtimes could be enjoyed. What is wrong with you all?! 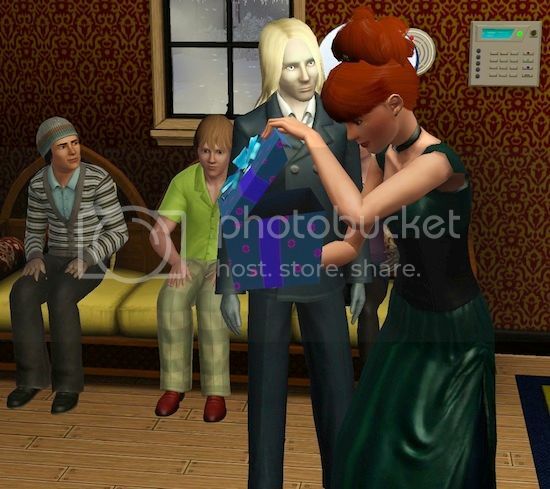 While mildly hilarious at times, I must say that the behaviour of the SF sims from this point forward was frequently inappropriate. Poor Sugar put up with an awful lot. Minty enjoyed coming round to take naps in her bed (uninvited). Deary me. Later Sugar met Minty at some place in town and he talked incessantly at the poor girl. As you can see she is truly absorbed in his sparkling conversation. "And then you stir the polenta!" Also, what are you wearing, Minty?! 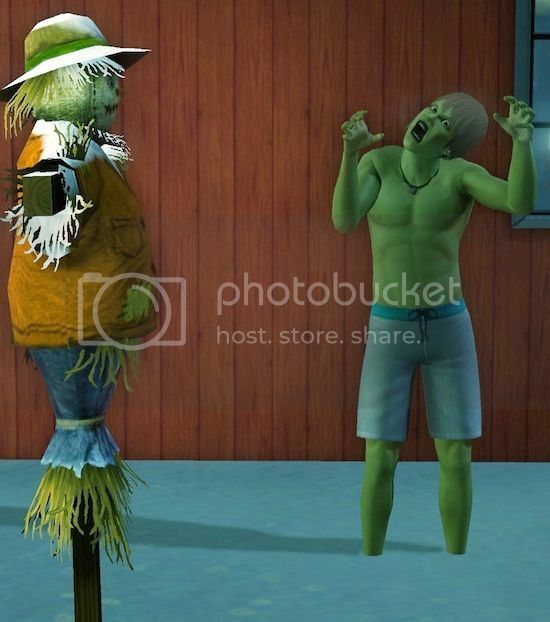 This is what happens when you let sims choose their own clothes. Anyway, since Sugar now has her Fine Arts degree, she thought she might maintain Minty's good humour by doing a sketch for him. Being sketched brings out the poser in him. Poor Sugar, she was quite impressed with the way she'd captured Minty's style and nuance. Well done, looks just like him I'm sure. Minty looked less impressed (but then he is a grumpy sod in this game, isn't he)! Sugar invited Caspin round to see if she would like a sketch as well. Caspin, for reasons best known to herself, decided that Sugar's attempts to accurately depict Minty's outfit had been so rubbish, that she would simply dispense with clothes entirely. For heaven's sake! The sketch turned out.... really.... well. Probably a good idea to just do shoulders and upwards on this occasion. That's what they must have taught her at Art School. Christmas came round (or whatever they call Christmas - Snow Day?) and Sugar held a big gift-giving party. I haven't held one of those before and was quite impressed that a big pile of gifts materialised on the floor of her house. Cool! What I did not quite appreciate was that the guests would all bring food. Sugar had cooked all day so there was a ridiculous amount to eat. Here's Minty turning up with a cheese pizza and Caspin's outside with some cookies (eating them, probably!). Other guests brought bread and something unidentifiable claiming to be a "fritter". Frittered what? Possibly best not to ask. And ate and ate and ate. Nomnomnomnom! This made me laugh. We look like we're doing some very determined girls-can-eat-a-whole-cheesecake after being dumped or something! At least Mr Shouty has cheered up and I intervened with his outfit so he wouldn't disgrace us. Why is he so squee? Because of opening the presents of course! Shame that (a) the presents contained nothing more exciting that COAL! and (b) creepy dude watched rather too intently. Oh well, all are happy now so that's a nice ending. This, I realised, is not Celebrity Ollie, this is the nice Ollie from the ice-rink. Not too proud to boogie, this one! Better stop there while everyone's smiling! I get the first two pumpkins either side but the one in the middle looks like it was made by a drunk. They are a menace on campus, especially if you are hit with the multi-zombified-Ollie situation. I have changed the moon setting now so that it's always a waning gibbous. No more full moons will be endured! Today has been a bit of a struggle, as I endeavour to play on the native OS of the iMac. It hasn't gone too badly, with only one infamous "fatal exception" error and one freeze while in CAS. At least this way only the game crashes, instead of destroying the whole damned hard drive! Apart from that, mostly fun. I am trying to become a doctor in my test game. I really don't think I'm cut out for it. This festival worker was taken ill with a tummy ache while on duty in the park (which makes you wonder if it is wise to eat the festival snacks). If I had stomach pains and my doctor came towards me with one of those I would react very badly. 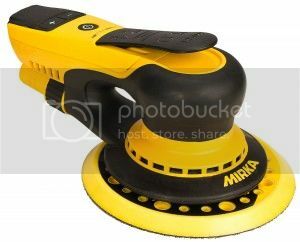 It looks like one of these, non? 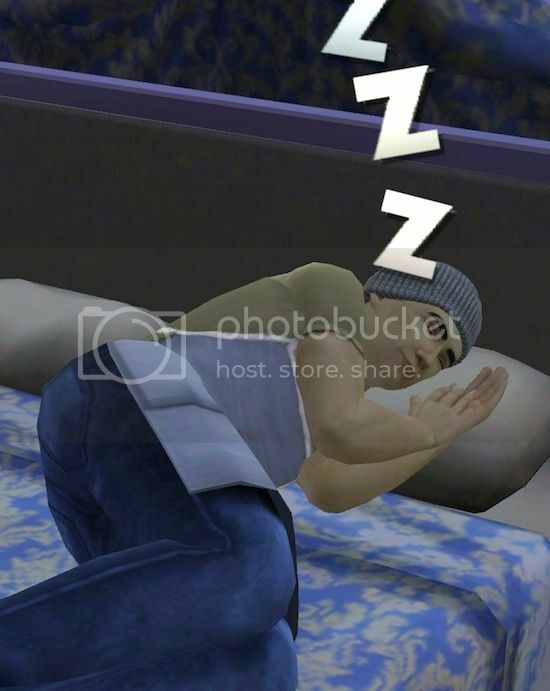 Ah well, that's sims for you. "Doctor Doctor, I have a tummy ache, can you help?" "Here, let me sand your face." 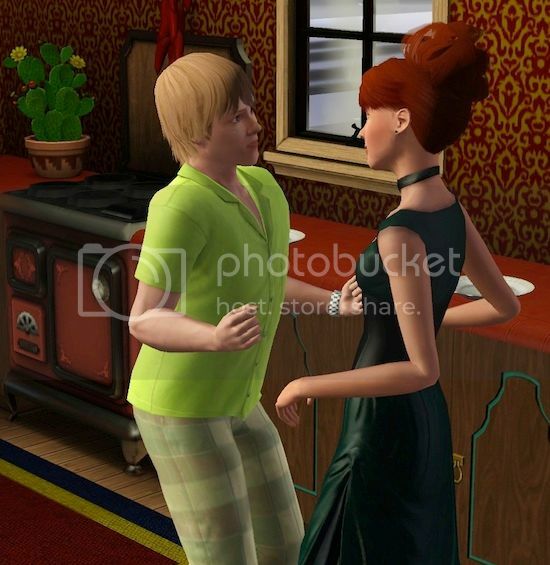 Seriously, how big are pills in TS3? MASSIVE, that's how big! And what (I ask you - what?!) are those hands on the left-hand side of the picture aiming to do? In other news, Ollie had his hover-sharks, but I have hover-fruit. Yes, here are some magically suspended apples. 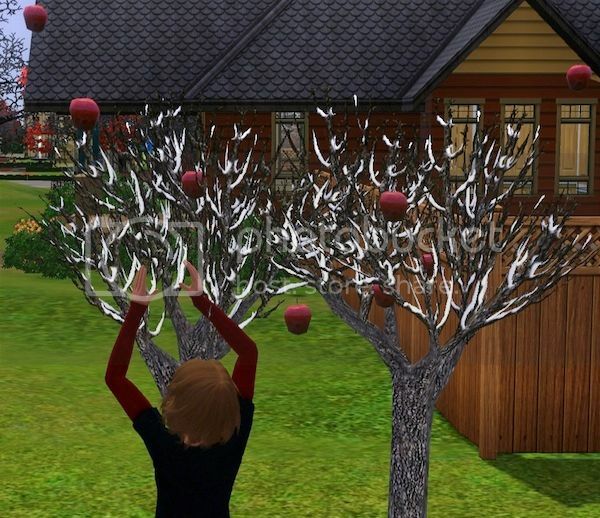 Haha, who needs gravity when you have floating apples?